Wow. The Philadelphia Inquirer fights back. It endorsed Alex Law for US Congress, over US Rep Donald Norcross. Until 2014 it was co-owned by Donald Norcross's older brother, George Norcross and Sam Katz. Sam Katz with Gerry Lenfest bought out George Norcross, a week later, Sam Katz was killed when his private plane crashed, and shortly after, Sam Katz's estate sold his share to Gerry Lenfest. In early 2016, Gerry Lenfest donated his online and print newspapers to a media institute he created, the Philadelphia Media Network, and made part of the gift that it is not permitted to influence editorial function and news gathering. A magnificent improvement over the Norcross days. God bless Gerry Lenfest. In 2013, the Philadelphia Inquirer endorsed Republican Governor Chris Christie for re-election, rather than the Democratic nominee click here. The Norcrosses are Democrats in name only: where a Democrat is defined as someone who cares about working folks having living wages, and Republicans see working folks as folks who will work for as little as possible. "South Jersey Democrats ... most heated contest is in the Camden County-based First District, whose freshman congressman, Donald Norcross brother of South Jersey's top Democratic power broker. A week after he was sworn in to the Assembly, he was promoted to a vacated state Senate seat. Four years after that, a midterm exit - by US Rep. Rob Andrews put Norcross on a short circuit to Congress, powered once again by party unanimity. "Norcross ..... achievements in Washington have been limited. The congressman notes that he introduced a bill to raise the minimum wage and has helped bring federal funds to the district. ".....the congressman...sometimes sides with Republicans in favor of industry and defense. The challenger has criticized Norcross' votes against the Iran nuclear deal, consumer financial protections, and refugee resettlement. Norcross says he takes pride in sometimes straying from the party line. "Law's most persuasive critique of Norcross concerns his reliance on donors with government contracts. 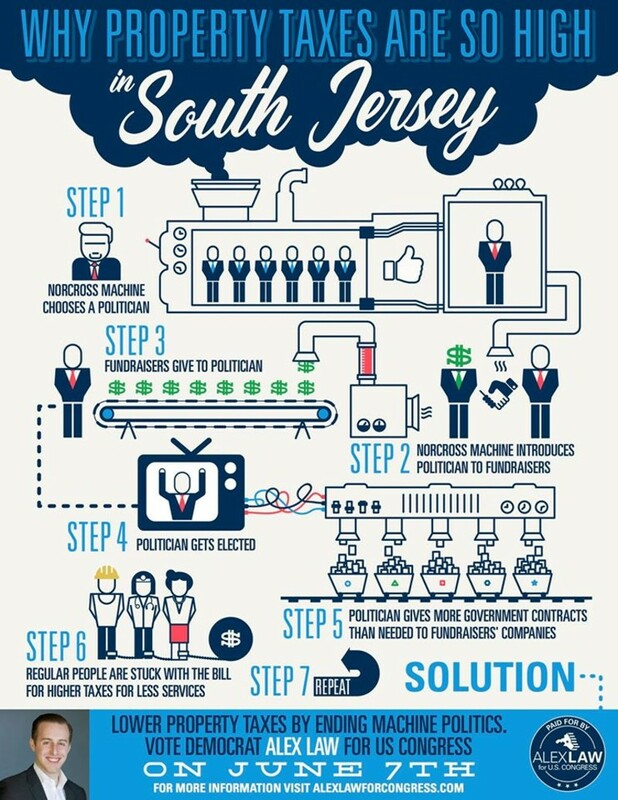 Pay-to-play politics have been elevated to a dark art in South Jersey, but Norcross addresses the issue by insisting he is just an electrician-turned-politician with no special connection to such machinations. "Democratic voters longing for a genuine departure from the entrenched political establishment that Norcross embodies should choose ALEX LAW." 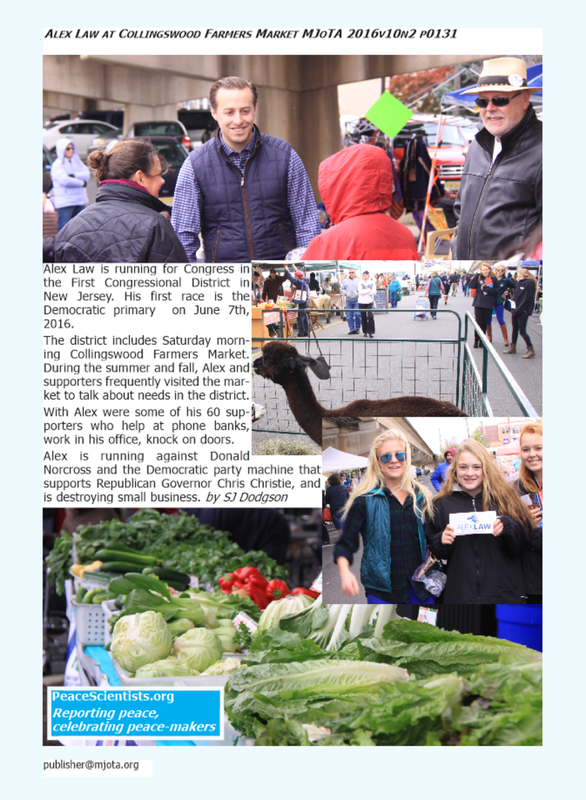 Alex Law is the hardest-working candidate I have ever known. And he is real, he lives and breathes his convictions, as anyone who has known him since he was a child will tell you. Our previous US Congressman was Robert Andrews, a personable law graduate whom I met twice during his 20 plus year tenure. He suddenly became a liability to the Democratic machine, or maybe he just got in the way of the Norcrosses. I was appalled to receive an email from him stating he was resigning, effective immediately, and less than one hour later, getting an email from Donald Norcross saying he had been endorsed to replace him by a score of organizations. That was in 2014. He won the Democratic primary election, and the November election to fill out Robert Andrew's unexpired term, and to start a new term, in January 2015. The Norcrosses are hand-in-glove with Governor Chris Christie, who is the most fervent supporter of the Tangerine Baffoon who has so captivated racists, sexists and bigots in the Republican Party. A vote for Alex Law is a vote for a good candidate, the best candidate, a candidate who is not beholden to special interests, whose candidacy has been entirely fueled by grass roots support. I don't want a Tangerine Baffoon for president, and I certainly do not want the Tangerine Baffoon's friends to keep carving up New Jersey. America is already great. I want us to make America kind again. Alex is a young man who is organizing the folks in South Jersey to stand against the unholy marriage of Governor Chris Christie and US Rep Donald Norcross (formerly NJ State Senator Norcross). Alex Law v Donald Norcross. People v big money. David v Goliath. Money for public schools in Camden has been handed over to private developers, like Donald Norcross's brother. Charter schools can be successful when every dollar is used to educate children and pay for education infrastructure, I know some. When charter schools are done badly, dollars are skimmed off by developers, CEOs, relatives and boyfriends, and impinge on the rights of every child to get a free education. The latter appears to be what is happening in Camden, according to conversations I have had with parents, teachers, activists in Camden. US Rep Donald Norcross and Governor Chris Christie look to me to have wandered into Camden, probably in George Norcross's helicopters, looked around like Captain Cook "discovering" Australia, looked at all the faces of the natives, and said to each other, "There's no-one here! Terra nullius! We can take it!" And happily started handing out parcels of land to developers, making sure no-one paid taxes. Not to the city, not to the state. Governor Christie decided to take over the school district of the City of Camden in 2013, and has been happily shutting down one school after another. Thus preventing Camden's children from getting a decent education in grade school and in college. Charter schools are abundant in Camden County, but only in the City of Camden. Elsewhere in Camden County is a single charter school in Blackwood. Towns like Haddonfield, Collingswood, Cherry Hill run public schools where children get great educations. For example, my own four adult children, all college-educated, all went through the Haddonfield schools click here. Can Alex fix the schools in Camden? With support from local and state elected officials, absolutely yes. Electing Alex will be the first shot in overcoming the South Jersey Democratic machine that is determined to undermine the futures of so many bright children in Camden. Apartheid. Appalling. Shame on you Donald Norcross. Good on you Alex! David v Goliath. My money is on David. He won the first time.